Select the Dwyer Magnehelic® gage for high accuracy measurement of differential pressure of air and non-combustible compatible gases. Gauge is guaranteed within 2% of full scale. Select from a wide choice of 81 models available to suit your needs precisely. Using Dwyer's simple, frictionless Magnehelic® gage movement, it quickly indicates low air or non-corrosive gas pressures--either positive, negative (vacuum) or differential. The design resists shock, vibration and over-pressures. No manometer fluid to evaporate, freeze or cause toxic or leveling problems. It's inexpensive, too. Samarium Cobalt magnet mounted at one end of range spring rotates helix without mechanical linkages. Die cast aluminum case is precision made and iridite-dipped to withstand 168 hour salt spray corrosion test. Exterior finished in baked dark gray hammerloid. One case size is used for all standard pressure options, and for both surface and flush mounting. Blowout plug of silicone rubber protects against overpressure on 15 psig rated models. Opens at approximately 25 psig. O-ring seal for cover assures pressure integrity of case. Housing: Die cast aluminum case and bezel, with acrylic cover, Exterior finish is coated gray to withstand 168 hour salt spray corrosion test. Accuracy: ±2% of full scale (±3% on -0, -100PA, -125PA, -10MM and ±4% on -00, -60PA, -6MM ranges), throughout range at 70°F (21.1°C). Pressure Limits: -20" Hg. to 15 psig.† (-0.677 bar to 1.034 bar); MP option; 35 psig (2.41 bar), HP option; 80 psig (5.52 bar). Overpressure: Relief plug opens at approximately 25 psig (1.72 bar), standard gages only. Temperature Limits: 20 to 140°F. * (-6.67 to 60°C). Process Connections: 1/8" female NPT duplicate high and low pressure taps - one pair side and one pair back. Weight: 1 lb 2 oz (510 g); MP & HP 2 lb 2 oz (963 g). A-299 - Mounting bracket, flush mount Magnehelic® gage in bracket. Bracket is then surface mounted. Steel with gray hammertone epoxy finish. 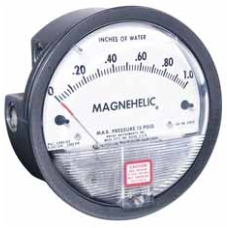 A-300 - Flat aluminum bracket for flush mounting Magnehelic® gage. A-310A - 3-way vent valve, plastic, 1/8" NPT to 1/4" metal tubing, 80 psi rating, replaces former Model A-310 (brass). A-432 - Plastic carrying case for Magnehelic® gage of standard range, except high pressure connection, includes 9 ft (2.7m) of 3/16" ID rubber tubing, stand-hang bracket & terminal tube with holder. A-321 - Brass safety relief valve, protects Magnehelic® gage or Photohelic® switch/gage against over pressure due to regulator failure, etc, opens at 10 psi. Mounts in tee fitting. 1/4" NPT(M) (use two for DP application). Dwyer Magnehelic Differential Pressure Gauge. mm w.c.